Poulton - the town by the pool - is situated in the North West of England in the county of Lancashire. The name is derived from the River Wyre, situated at the bottom of the Breck at Skippool. In 1842 'le-Fylde' was added to the name when the Penny Post began, to stop local post mistakenly being sent north to another village called Poulton - later to become Poulton-le-Sands; it is now part of Morecambe. 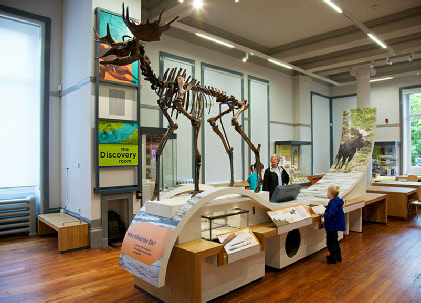 An exciting discovery in July 1970 gave Poulton-le-Fylde international fame - an almost complete skeleton of a 13,500 year old elk was found as foundations were being dug for a new house on Blackpool Old Road, Carleton. What made the find so important was the discovery of hunting barbs embedded in the leg bones - indicating that human hunters had lived in this area around 12,500 BC. This is the earliest evidence yet found for man living this far north, in the days when Britain was part of the continent of Europe and it would have been possible to walk from Poulton to the Ural Mountains in Russia. Many of the field names in the area where the elk was found conyain the words marsh or mere, indicating the type of land. It is assumed the elk was injured by barbs and managed to find some high land where he finally perished. The land where the elk was found was next to the home of the Scholey family and it was Mr Scholey who found the remains late one Friday afternoon in August 1970. 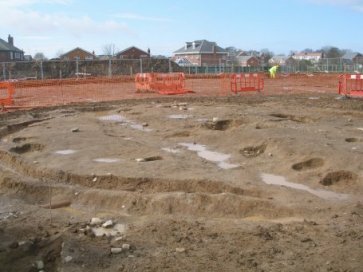 Although a small Roman fortlet existed and has been excavated in Kirkham about 15 miles from Poulton, there is no definite evidence that the Romans made any effort to develop the area nearer the coast. For centuries the land of the Fylde coast was marsh, stagnant peat moss and sand dunes with only a meagre population, and very inhospitable to the traveller. In his 'Geography', Ptolemy of Alexandria mentions a 'Portus Setantiorum' and one of several possible positions for this long lost site lies in the waters of the Lune Estuary off Fleetwood. However David Shotter, in his recent book 'Romans and Britons in Northwest England' says "we should bear in mind that the Setantii may have lived in Southern Cumbria and the Portus Setantiorum may be an elusive site near the Southern end of Lake Windermere." In March 2008 United Utilities began work on a new pipe line contract on grazing land near Garstang Road East. As is the case with any large scheme, an archaeologist was present on site when the work was begun and it soon became clear that a significant discovery had been made. The remains of two roundhouses thought to date back to the second century AD were discovered. 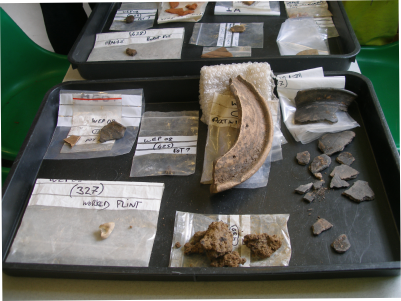 A small amount of black burnished ware pottery was found which helps to date the round house. The remains of the main roundhouse to be excavated, which the team believe would have been a dwelling house, included an outside drainage gulley, holes for the timber wall supports, some cobbles and a storage pit. A larger pit, found with large stones in it would have been a hearth. Also discovered are signs of a further roundhouse a few metres away, suggesting this could have been the site of an early settlement. There is also evidence of medieval ridge and furrow ploughing. Finds like this are very rare in Lancashire, and especially in this area. 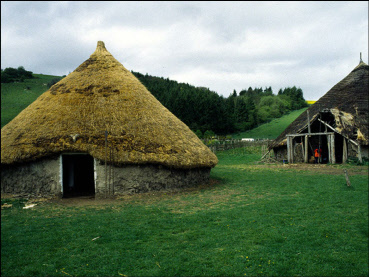 To date only two similar roundhouses have been found in Lancashire - one outside Lancaster and one near Lathom.